Commemorative Swiss stamps of 1941 to 1945 highlight important national programs and events. Though, Switzerland was neutral during the war, it was completely surrounded by Axis nations or Axis-occupied nations. This situation created many shortages of food and consumer products, causing rationing and making things difficult for both the Swiss government and the Swiss people. 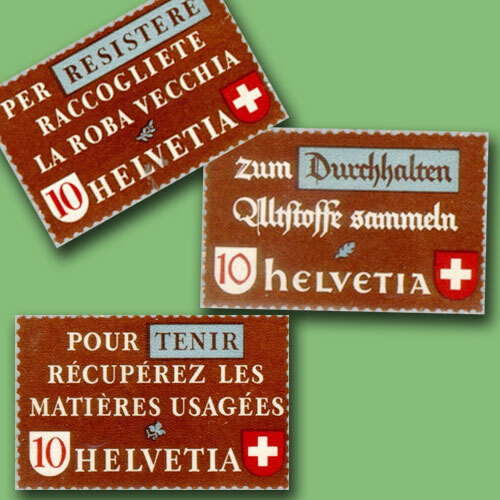 The three Swiss stamps issued on March 21, 1942, were to promote Waste Recycling, another reminder of Switzerland's isolation during the war. The stamps in this set were inscribed "IN ORDER TO ENDURE, RECLAIM USED MATERIALS" in French, German, and Italian. The stamps feature the message in the centre and the name of country at the bottom flanked by the denomination at left and the Red Cross symbol on right.